Occitan isn’ just the troubadours! The language is still spoken in the south of France and parts of Italy and Spain and has a vibrant contemporary literature. James Thomas has put together an astonishing collection of Occitan texts – from the 10th century to the present day. Troubadours too! Including the women troubadours, the Trobairitz. Five years of research, it’ almost 800 pages long. Occitan is a Romance language spoken in southern and south-central France, the Val d’Aran in north-eastern Spain, and a small part of north-western Italy. For many, it is associated with the troubadours, composers of courtly lyric poetry in the twelfth and thirteenth centuries. This anthology offers something new. Alongside troubadour and other medieval texts, Grains of Gold introduces the English-speaking reader to the rich body of Occitan literature from the middle ages to the present day, covering the Renaissance, the Enlightenment and French Revolution, Romanticism, Frédéric Mistral and the Félibrige – the first organised revival of Occitan – Modernism and twentieth-century Occitanism, as well as the work of twentieth- and twenty-first century writers. 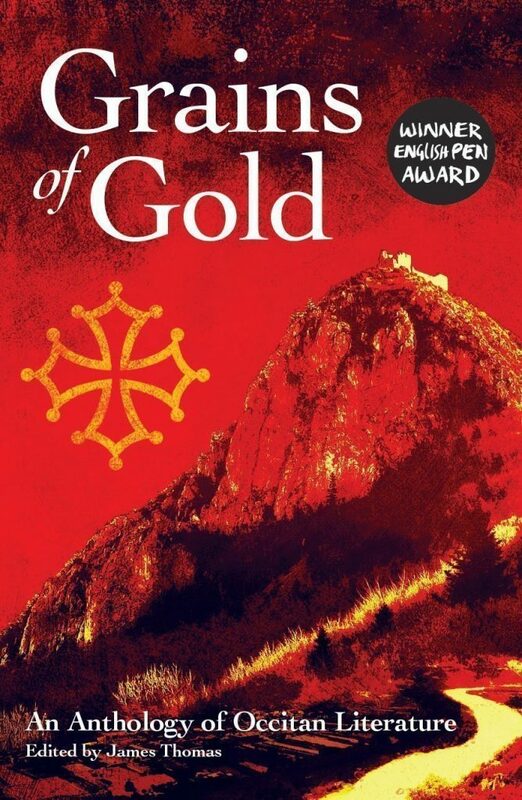 Grains of Gold offers English-speaking readers – students, academics, lovers of southern France – a unique opportunity see Occitan literature within the context of European and world culture. James Thomas is a professional translator from Occitan and Catalan and a researcher in nineteenth- and twentieth-century Occitan literature. His is the translator of Solstice and Other Poems: Poems in Occitan by Aurélia Lassaque (2012) and has published articles on Occitan-related subjects and translation theory. Towards the end of this excellent volume its editor James Thomas suggests that there are perhaps as few as 500,000 active speakers of the langue d’oc, until as recently as 1914 a language widely spoken in the southern half of France and in areas of northern Italy and the Val d’Aran in Spain. Many older people can speak the language in its various dialects but rarely do so even within their own families, yet their own parents were monoglot Occitan speakers. It’s disturbing that a language can be destroyed so quickly. Occitan was once the language of European culture — it was the language of the Troubadours whose poetry changed the course of European literature. Thanks to them, it was the first Romance language to have a standard grammar and it inspired Dante and Petrarch to create a standard Italian language, an important feature of the Enlightenment. Occitan has been a culture under siege since the Cathar crusade from 1209 to 1229. It was a racist attack on the culture and language of southern France. In 1539 French became the sole official and judicial language of the whole country (replacing Latin) and its dominance increased as a result of the French revolution of 1789. But the latter’s “egalite” in linguistic terms meant uniformity of speech, not equality of status between its differing languages. While the Troubadour poetry it contains will interest many readers of this book, even more engrossing and valuable are the chapters from Frederic Mistral and the “felibres” — “pupils” — up to the present. Mistral is often portrayed as the only writer in a lesser-used language to be awarded the Nobel prize for literature. As well as its value as an anthology, the background information — particularly on political attitudes towards the Occitan language and culture — is excellent. The French have portrayed its regional languages and cultures as a regressive, right-wing influence, with accusations of collaboration in WWII. Certainly the “Felibrige” attracted the admiration of Petain and the fascist Charles Maurras. But it was also led by the socialist poet and novelist Felix Gras and had a communist wing. The socialist leader Jean Jaures advocated the teaching of Occitan in schools and many left-leaning French intellectuals and artists saw Occitan culture as a symbol of enlightened resistance to dominant orthodoxies. This latest in the Francis Boutle anthologies from lesser-used languages is an important contribution to our understanding of a little-known aspect of the story of France.